Twitter seems to have a fairly universal appeal; in addition to everyday users, it is frequented by police departments, government bodies, brands, news anchors, celebrities, journalists, photographers and more. Because use is so widespread, perspectives on what’s going on in the world are easier to access than ever, and it’s adding an entirely new dimension to the way we find out what’s happening. More and more people are choosing to be a part of Twitter just so that they can stay up to date on current events. President Barack Obama's three word tweet after winning the U.S election surpassed 700,000 tweets. 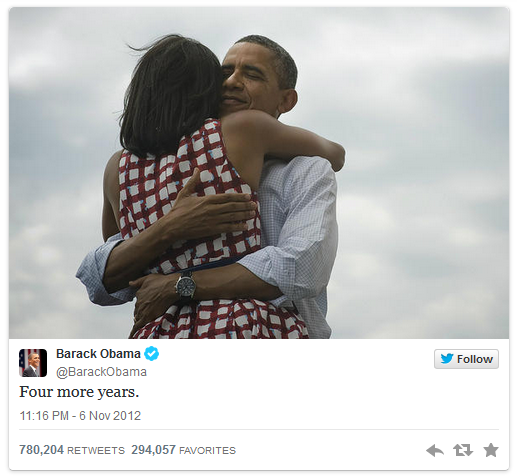 The simple "Four more years," tweet also had a photo of the President and First Lady Michelle Obama hugging. According to reports, this became one of the most retweeted posts of all time. 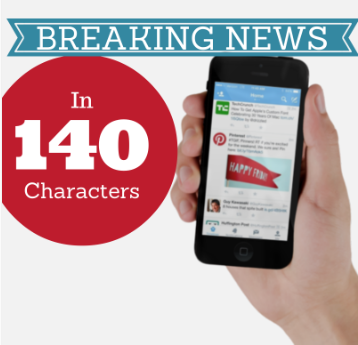 When something newsworthy happens, Twitter usually beats traditional media to the punch. While camera crews and reporters are just arriving on scene, bystanders involved in the event are sharing what they’ve heard and seen. Coverage isn’t limited to those onsite, though. During Hurricane Sandy, over 20 million tweets about the storm were shared between October 27th and November 1st – nearly 35% were news related, another 25% were photos and video. Tweets ranged from updates about the positioning of the storm and the impact to news outlets sharing guides and media (For example, the New York Times shared a helpful state-by-state resource with information regarding utilities, drop-in centers so on). Twitter Not Just Reporting News – But Creating it, Too. Sometimes, what happens on social media becomes news itself. Israel announced a Gaza invasion via Twitter, Utah’s Attorney General announced the execution of a mass murderer and the Boston Police Department used Twitter to rally the public for help in identifying potential suspects as well as notify people to stay indoors while on the hunt for the suspect. Businesses are often foregoing the press release altogether and making major announcements on Twitter, where they’re gobbled up by followers and spread faster than front-page news. Deals, specials and promos are all common announcements for brands – but more weighty matters are shared, too.- The U.S. military announced their new social media policy on Twitter and The New York Times used twitter to announce their online subscription platform. The SEC has ruled in favorof allowing companies to alert their investors, and Twitter themselves announced their own IPO via, well… Twitter. But This All Comes With Pitfalls, Too. While few would argue that immediate access to developing news stories is a bad thing, there’s a dark side to this newfound method of citizen journalism. First, there’s the fakes. All it takes is one errant but convincing tweet to start some serious rumors. During the LAX shooting, a fake account began circulating the rumor that the former NSA director, Michael Hayden, was among the dead. That tweet was picked up by the Globe and Mail, hungry for a unique scoop – and for a time confusion and misinformation abounded. During the Boston Marathon, similarly fake tweets emerged – comprising up to 29% of all the content that went viral during the event. Users must be careful as they analyze what comes across the channel, but as our hunger for immediate information grows, so does the opportunity to be misinformed. The second challenge is that brands and businesses who schedule their tweets ahead of time can risk coming off insensitive - or worse – during times of crisis. Because news travels quickly, businesses are on the hook to respond equally fast and be very careful of how they conduct themselves during developing events. Still, Twitter – And Lightning-Fast News – Is Not Going Away. The relevancy of Twitter as an information source no longer needs to be proven. 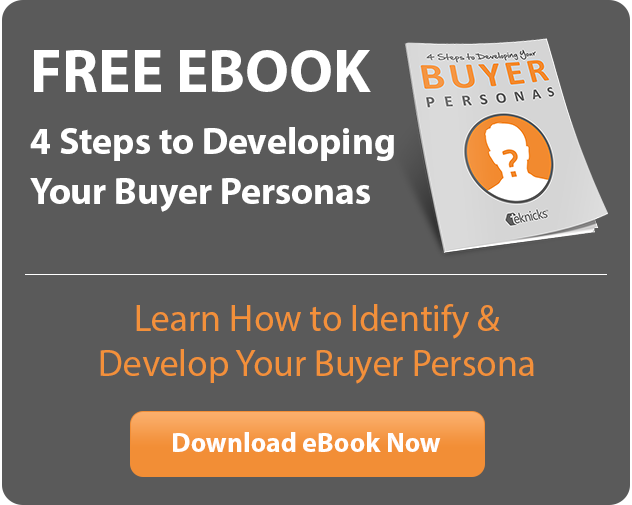 In an age where people turn to social media as a first point of learning for news and current events, and in a climate where it’s become acceptable to make major announcements on Twitter, the question becomes – how will you – and your business – respond? Let’s take a quick look at some of the ways Twitter has helped to shape the way we interact with both each other and learn about what’s happening around the world. An example from recent memory is the LAX shooting – shortly after the first shots rang out, bystanders were already on their phones and updating the world. In the days that followed, officials even pointed to the official LAX Airport twitter account[JMK1] as the public’s best source of timely data. And when the raid on Osama Bin Laden’s compound took place in 2011, a Twitter user inadvertently live-tweeted the entire thing[JMK2] . Coverage isn’t limited to those onsite, though. During Hurricane Sandy, over 20 million tweets about the storm[JMK3] were shared between October 27th and November 1st – nearly 35% were news related, another 25% were photos and video. 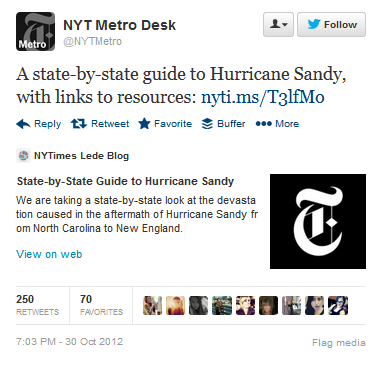 Tweets ranged from updates about the positioning of the storm and the impact to news outlets sharing guides and media (For example, the New York Times shared [JMK4] a helpful state-by-state resource with information regarding utilities, drop-in centers so on). It’s not always catastrophes, either. Twitter had an enormous role to play in the 2012 election[JMK5] , as Obama and other candidates took the opportunity to speak with voters directly. And after the election was over, the likes of U.K. Prime Minister David Cameron took to Twitter to congratulate Obama on his win. Sometimes, what happens on social media becomes news itself. Israel announced a Gaza invasion [JMK6] via Twitter, Utah’s Attorney General announced the execution of a mass murderer[JMK7] and the Boston Police Department used Twitter to rally the public [JMK8] for help in identifying potential suspects as well as notify people to stay indoors while on the hunt for the suspect. Deals, specials and promos are all common announcements for brands – but more weighty matters are shared, too.- The U.S. military announced their new social media policy [JMK9] on Twitter and The New York Times used twitter to announce their online subscription [JMK10] platform. The SEC has ruled in favor[JMK11] of allowing companies to alert their investors, and Twitter themselves announced their own IPO [JMK12] via, well… Twitter. First, there’s the fakes. All it takes is one errant but convincing tweet to start some serious rumors. During the LAX shooting, a fake account began circulating [JMK13] the rumor that the former NSA director, Michael Hayden, was among the dead. That tweet was picked up by the Globe and Mail, hungry for a unique scoop – and for a time confusion and misinformation abounded. During the Boston Marathon, similarly fake tweets emerged – comprising up to 29% [JMK14] of all the content that went viral during the event. The second challenge is that brands and businesses who schedule their tweets ahead of time can risk coming off insensitive [JMK15] – or worse – during times of crisis. Because news travels quickly, businesses are on the hook to respond equally fast and be very careful of how they conduct themselves during developing events.